Origin: Most of the United States east of the Rocky Mountains and down into a large part of Mexico. An indoor enclosure can be made from almost any kind of large open-top aquarium or wooden box. It should be at least 4 square feet per adult eastern box turtle, and include a few inches of sand, wood chips, mulch or soil. If a shallow water pan is kept in the cage it will require daily cleaning. Outdoor turtle pens are by far the most efficient means of maintaining colonies of more than a couple eastern box turtles. The eastern box turtles' omnivorous diet is usually easy to provide. These box turtles will accept almost any fruit or vegetable that is soft enough to bite. They do, however, prefer strong-smelling and/or brightly colored items such as overly ripe strawberries. In the wild, eastern box turtles feast on all sorts of insects, and earthworms seem to be especially relished. 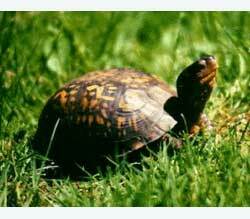 Various dog foods can also be given to box turtles, but only as a small part of their diet.